Fifth Avenue Art Gallery is happy to welcome Sandy L. Ford to their membership. Sandy graduated with honors from Ohio University Athens, Ohio, with a degree in Interior Design. She ran a successful design business, and became an ASID member until she decided to become a “sea gypsy” and world traveler. After spending twelve years sailing around the world with her husband on their sailboat, they now have chosen Melbourne, FL as their home port. Her work is crisp, clean, colorful, modern and combines math and the idea of balance. Being an interior designer, ASID, in her earlier years, she is used to seeing shapes, space allocations, colors and movement. “Now I am using what comes naturally to me in creating flat pattern designs where each shape is a flat shape based on the mathematical ratio of another shape while the colors dance to their own tempo” she quotes. 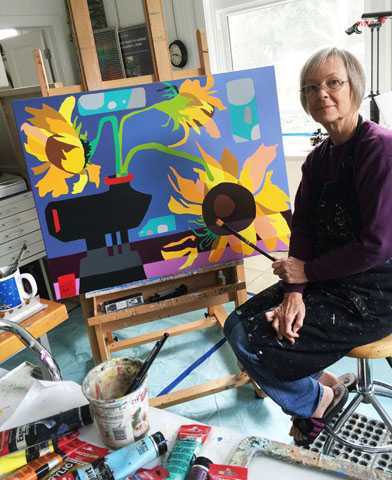 In her career she has done numerous commissions for homes, a hospital, and an industrial complex. Her work has graced two children’s books and the cover of a magazine, The New York Optimist.